James, Carmen, and the entire Secrets Hideaway Team is extremely proud to present the new look to Club Secret!! New tile and a brand new dance floor, 60" TVs on the walls, new VIP areas, and lighting galore. If you missed NYE 2016 at Secrets Hideaway, you missed one hell of a party. From the fireworks and champagne toast at midnight, to the 3 big screens showing the Ball drop at Times Square, this event is one for the books!! You will not believe the transformation of the lobby. 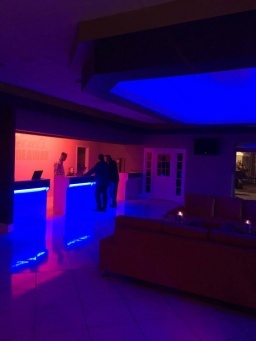 With new LED accent lighting and remodeled bathrooms, this area is your gateway to the party zone.